We don’t go out to eat that often. We cook a lot at home and now that we have a baby, it is just easier to dine in. We do miss going out for sushi. I can’t even remember the last time we went out for sushi…it was well before Caleb was born. To cure our sushi cravings, we have been making this Sushi Salad for dinner-sometimes twice a week. It is that good. 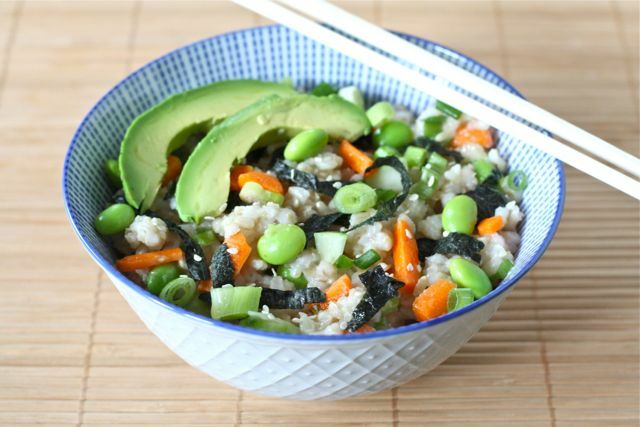 The salad has all of the flavors of sushi, but in an easy rice bowl form. We’ve made sushi at home before, but it is always an event. I love this salad because you don’t have to mess with rolling sushi, you throw everything in a bowl and you are good to go. 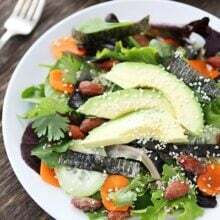 The salad has rice, nori, cucumber, carrots, avocado, edamame, pickled ginger, and sesame seeds. The salad is finished off with a light dressing that is made of wasabi, ginger, and soy sauce. You get all of the sushi flavors, but in salad form. This salad is a vegetarian sushi salad, but you could add some sashimi or any other of your favorite sushi roll ingredients. We buy all of the ingredients for this sushi salad at a local Asian market. Most larger grocery stores should have the ingredients, but if not, go to an Asian market, if you have one nearby. 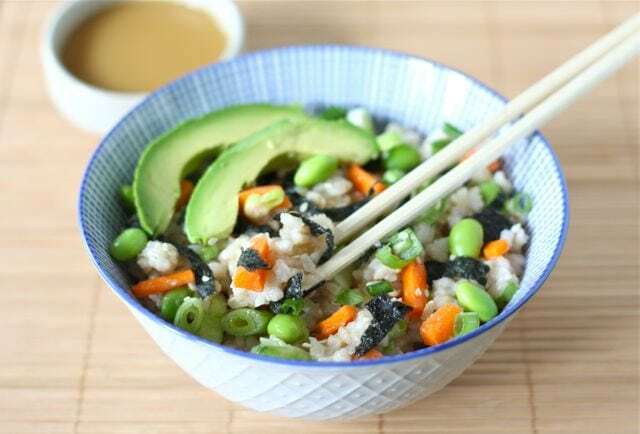 If you are in the mood for sushi, but don’t want to go out or roll sushi, make this simple Sushi Salad at home. It’s a good one! If you like sushi, you will love this sushi salad. 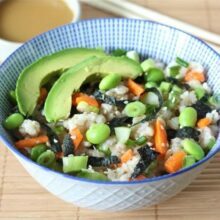 All of the same great sushi flavors, but in an easy rice salad! 1. In a large pot, combine rice and water. Bring to a simmer. Cover and cook on low for about 45 minutes. Meanwhile, in a small saucepan, bring 1/4 cup vinegar to boil with sugar and salt, stirring until sugar is dissolved and remove from heat. 2. Transfer rice to a large bowl and stir in vinegar mixture. 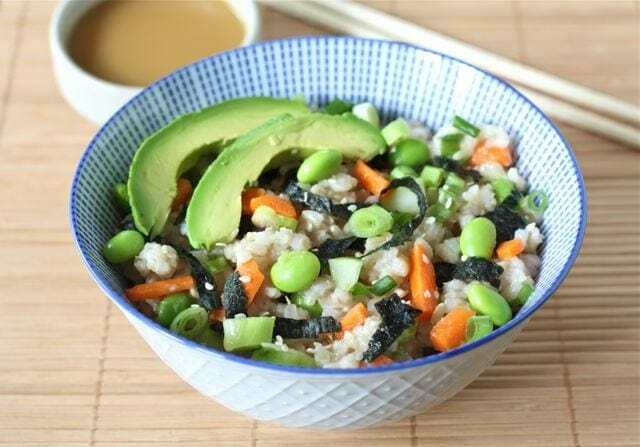 Cool rice and stir in sesame seeds, remaining 3 tablespoons vinegar, oil, ginger, green onions, carrot, cucumber, edamame, and nori strips. Top salad with avocado slices. 3. In a small bowl, stir wasabi powder into hot water and stir in cold water, soy sauce, and ginger juice. 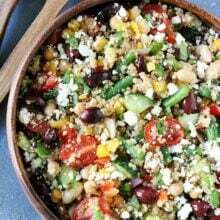 Drizzle dressing over salad and serve. Note-look for the ingredients in the Asian section of the grocery store. If you can't find them at your regular store, try an Asian market. A wonderful salad! Healthy and really enjoyable. Maria, you are brilliant. I love sushi, too, but had never thought of making it in salad form. I cannot wait to try this. It looks absolutely delicious! that is a great idea, I love it! Deconstructed sushi – I love it! I love this idea! I love how you put edamame beans in it too. This looks like a great way to get those sushi flavors without the pricey trip to the restaurant. it feels like FOREVER since we’ve had sushi…i’m definitely down with trying this at home! especially to help save some money…good sushi is expensive! We make something like this called “Chirashi Zushi” in Japan but has different ingredients. You still make the sushi rice but cook vegetables like Shitake mushrooms, dried gord shavings, carrots, bamboo shoots etc. in dashi stock, soy sauce, sugar, mirin etc. (the amount and ingredients vary) cool them and mix that up with sushi rice. Serve with shrredded nori (like Maria did), pickeled ginger on top. Some people put sashimi on top. WOW! I’m not a big sushi fan, but that salad looks so appetizing. Yum! I’m just about to write a post about a sushi class I went to. This sounds like a simpler way to enjoy the sushi taste without an instructor telling me how to roll and chop and etc. Looks yum! What an awesome idea! I absolutely adore sushi but it’s sort of a luxury for us, so this will definitely make an appearance in our house. Thanks! I haven’t had sushi in months and this sounds like it’l fit the bill for my often sushi cravings. Looks like I have most items…only need to shop for a couple to try this out…thanks a bunch.. The salad looks great! I’m not a huge sushi fan because I don’t like raw fish, but this dish I would love! I’m going to give it a try, the dressing sounds wonderful! What a fun idea! Yep, we love sushi! oh, and a little tip… if you ask nicely at your grocery store’s sushi counter (if you have one where they make it in the store), they can either give you or sell you a little bit of pickled ginger. It’s good to chop and put in rice! I love this – sushi deconstructed. Just perfect. And a good way for me to carry on my all out sushi obsession. This is such a fun salad, Maria. I adore sushi and know I would love the flavors in this. I would definitely be tempted to add some sashimi. I made this recently! Lovely for a quick dinner! I love the idea of these! I bet I’d have to buy quite a bit of ginger to get 2 tsp of ginger juice…glad it’s cheap 🙂 These look delish! Seriously fabulous idea. I want it for lunch!!! Very cool idea! I can’t wait to try it. This is such a great idea! I have been craving sushi like mad lately, and this looks like the perfect easy cure! Sushi, how I miss it! Since we don’t eat out often, this is one dish I would love to recreate at home. Thanks for posting! Wow – what a great idea! Love how you really captured all of the sushi flavors in this! My family would love this. Gorgeous! I just purchased some avocados and can’t wait to eat them with dinner! YUM! Yum! I can seriously see why you would eat this twice a week! Can’t wait to give this a try during one of my sushi cravings! This is brilliant! I never would have thought of this, and I LOVE SUSHI, so this is a perfect way to enjoy it without putting in too much effort! Love it! What a great idea! This looks so delicious and easy. Thanks for sharing! Sushi at home is great but definitely an event. This is amazing, though! Can’t wait to give it a try! Most excellent! I don’t find that making sushi at home is particularly thrilling. I’d much rather cure my occasional craving with some dine-in or take-out. But this? THIS I can do regularly, thanks! I told you this on Twitter already, but this idea is BRILLIANT! Love this idea so much! I’ve thought about making my own sushi at home, but this would be so much easier! How awesome is this? Sushi in a bowl, it still has all the goodies in you don’t have to suffer the awkward stuffing the roll in your mouth deal to capture all the flavors together. Genius! Made this for supper tonight, we absolutely loved it, oh, feeds 2 not 4 :)! It looks simple to make and I like all the healthy ingredients. Thanks for sharing the recipe. You’ll be about to go back out to eat when he is like 12!!! lol . I kid I kid! This salad sounds amazing! what a great idea! And now, of course, I’m craving sushi. And I never once thought of turning it into a salad. Lovely! Edamame right in the salad — brilliant! (we always order edamame as a starter when we go to sushi) I made sushi salads a couple of times but missed that hit of wasabi, so the last time I toook 1/4 c. rice and loaded it with wasabi paste, then pinched it off into the salad and mixed gently — wasabi hit! I like your combo of ingredients; thanks! Mmm, what a great idea and easy way to satisfy a sushi craving at home! I so love this idea! What a perfect, totally do-able idea! I love the idea of an easy at home take on sushi! 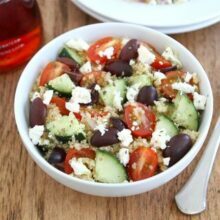 Great way to incorporate all the ingredients of the favorite restaurant staple for any night of the week! Sushi and avocado…. my fav’s! this is genius! i love everything about this salad. sushi is my absolute favorite Maria! I finally got to make Sushi Salad today. WOW. I had to make myself stop “tasting” it to ensure that I would have some left for dinner. Tastes just like veggie sushi. Thanks for the wonderful recipe! I was on a roll (no pun intended) and making something like this on a regular basis and then, for no reason, I stopped. Thanks for the reminder of what is SUCH a great dinner. We love veg sushi in our house and I’m excited to make this again. I love the edamame addition! This is brilliant – I can’t wait to try this! I could eat this several times a week – love sushi and this no-fuss way of enjoying it. Oh Maria, I am so smitten with this sushi bowl concept. I’ve made sushi before, but it takes so much effort. I think I could throw this together on a weeknight. Thank you! I made this tonight, swapping in fake crab for the edamames, and it tastes just like a California roll! I love it and will be making it again very soon. I made this today, and it was AWESOME! I blogged about it and linked back to you. Thanks so much for the recipe. I’ll definitely be making it again! Thanks for the shout out! So glad you liked the sushi salad! This is quite possibly the best recipe ever. It tastes like sushi, but its soo easy! Thanks! This picture has been posted on a facebook page called Culinaria Fusion. They have posted many recipes from different websites claiming it to be their own and saying that they are preparing for releasing these in a cookbook soon. THIS IS TO ALERT YOU TO A FACEBOOK PAGE Culinariafusion-Culinary Consciousness Cookbook, THEY HAVE POSTED THE ABOVE PICTURE ON THEIR PAGES. MOST PICTURES ON THIS PAGE ARE STOLEN FROM DIFFERENT WEBSITES. EVEN THE CAPTIONS AND COMMENTS HAVE BEEN LIFTED FROM VARIOUS PLACES ON THE INTERNET. NO CREDIT HAS BEEN GIVEN TO THE REAL AUTHORS OF THESE RECIPES. AS MENTIONED IN THE POST BELOW, PEOPLE ARE BEING MISLED INTO THINKING THAT THESE PICTURES ARE OF DISHES MADE BY THE OWNER OF THIS WEBPAGE FOR THEIR UPCOMING COOKBOOK. Any idea on how well this keeps? Would love to make this for lunches. Oh my word I LOVE this!!! Genius! Pingback: Daisy Chubb's Tea and Treats » Blog Archive » Pinterest Post! I wish this was my meal. I have made this 3 times now. It is delicious!!! I add salmon, mushrooms and broccoli for added depth. Thanks for a delicious recipe! Excellent salad! 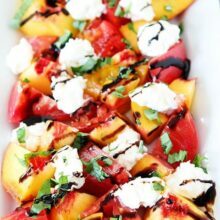 Thank you for sharing a super yummy, easy and flavorful recipe! Serving sizes were HUGE! We started with hot & sour soup and ended up with 1/2 the salad left. All looking forward to the leftovers. Our only change – we added crab stick and didn’t mix the salad dressing or avocado in with the salad, anticipating we’d have left overs and it’d keep better. This is an EXCELLENT recipe. I made it a year or so ago when my son was home on R&R leave and he’s coming home this weekend and THIS is the ONE recipe he’s asked me to make for him. HE LOVES IT! My whole family loves it. How awesome of you to think it up! Thank you!!! Keep up the good work. I mad this for a lunch with my dear friends of nearly 50 years. Wow. It was amazing. I served it as a stacked salad, patted the rice into a ring mold then piled avocado and cooked salmon on top. it was beautiful and delicious. The sauce was very spicy, my wasabi must have been super hot. I had to tone it down a bit. Excellent! Thanks. I love this salad. I made it as a stacked salad with the avocado and some flaked baked miso salmon on top. It was gorgeous and delicious and perfect forgo etching special on a hot summer day. This sounds lovely, but I have a question…. you call this a ‘sushi salad’ but I notice you use brown rice and not sushi rice….Is this for health reasons?.. And wondering how this salad would work using sushi rice?